Lakers fans who double as sneakerheads aren’t going to like this one. Magic Johnson is one of the most iconic basketball players to ever don the purple and gold. And as Jay-Z puts it, Magic isn’t just a businessman, he’s a business, man. The hall-of-fame point guard is worth a reported $500 million thanks to noticing opportunities that most ignore in urban areas from movie theaters to Starbucks. 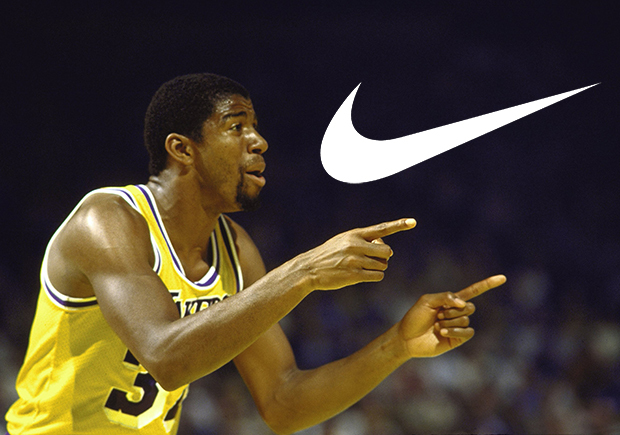 But there’s one business decision that still haunts Magic to this day: he could’ve signed with Nike. Magic was recently a guest on The Ellen Degeneres Show and revealed that Phil Knight approached him to sign with the relatively unknown Swoosh for a signature basketball shoe straight out of college. They couldn’t give him a competitive offer compared to the likes of brand giant Converse at the time (now ironically owned by Nike) but did offer him a hefty share of stocks. “All the other companies offered me money, but [Nike] couldn’t offer me money because they just started. So he said something [about] stocks —- ‘I’m gonna give you a lot of stocks.’ I didn’t know nothing about stocks. I’m from the inner city, we don’t know about stocks” Magic said to Ellen. Granted, Converse and Magic did manage to put out some iconic ads and a few very decent models but imagine the cultural impact that a Nike Magic 1 would’ve had. Or perhaps the Air Jordan 1 wouldn’t have ever happened and instead, we’d all be trying to get the Purple and Gold version of the Nike Magic 1 and praising Magic for being a pioneer in the sneaker game instead of Mike. “I’m still kicking myself. Every time I’m in a Nike store, I get mad. I could’ve been making money off of everybody buying Nikes right now,” he said. Watch a snippet of the interview below.